Takata Corp., the Japanese firm responsible for more than 31 million motor vehicle recalls, was back in the news recently as the number of affected vehicles continues to increase. On March 2, 2017, Ford recalled 3,200 vehicles due to a faulty airbag module on the front driver side. This latest recall came only days after the company pleaded guilty to deceiving automobile manufacturers in regard to the safety of their airbags. News about the Takata recalls began to surface in 2008 when Honda recalled more than 4,000 vehicles due to faulty Takata airbag filters. At that time, it was alleged that the airbag inflators were producing excessive internal pressure, which caused them to rupture. As a result, metal fragments would spray into the car during a crash, potentially causing severe injuries. Over the next eight years, numerous existing recalls were extended, and new ones were issued, resulting in the largest recall in U.S. history. In May 2009, an Oklahoma teen died when her airbag exploded, sending metal shards into her neck. 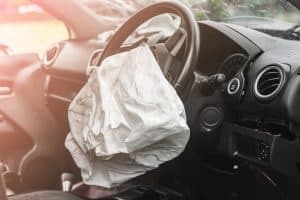 In December of 2009, a Virginia woman died when metal shards from her exploding air bag punctured arteries within her neck. In September 2013, a California man died after being involved in a car crash. According to the coroner’s report, his death was caused by facial trauma from foreign objects inside of the deployed air bag. October 2014, a Florida woman was killed by shrapnel shooting from her exploded airbag. In October of 2016, the National Highway Traffic Safety Administration (NHTSA) confirmed 11 fatalities resulting from Takata airbag defects. These tragic examples are only a sample of the numerous fatalities and severe injuries that have occurred when vehicles or their parts fail to operate correctly due to defects. Far too many people fail to take automobile recalls seriously, but as these incidents exemplify, this could be a fatal mistake. When automobile defects lead to serious injuries, there may be numerous entities at fault. The vehicle manufacturer may be responsible for a defective design or faulty manufacturing. The makers of each individual part, such as Takata, may also be liable for their part in causing injuries to drivers, passengers, and others. In May of 2017, per USA Today, “Owners of nearly 16 million vehicles with potentially defective Takata air bags are eligible for financial assistance in getting their vehicles fixed and up to $500 in compensation under the terms of a new consumer settlement with several automakers. Certain Toyota, Mazda, Subaru and BMW vehicles equipped with Takata air bags that could explode in a crash are included in the $553 million deal aimed at covering economic losses” (emphasis ours). This new deal, which has not yet been approved, is in addition to the one billion dollars in penalties Takata will pay, after pleading guilty in federal court back in February of this year. If you believe that you or a loved one was injured by an auto defect, contact the knowledgeable Georgia auto defect lawyers of Harris Lowry Manton LLP. We have the skill and resources to fully investigate the cause of your injuries and hold responsible car manufacturers accountable. We can be reached through our contact form, or you can phone us at 404-998-8847 in our Atlanta office, or in Savannah at 912-417-3774.